1 Gram Silica Gel Packet (Cotton) is used to absorb moisture and prevent Mold, Mildew, Corrosion, and Fogging. Each Silica Gel Packet weighs 1 Gram and measures 1 1/2" in length by 3/4" in width. 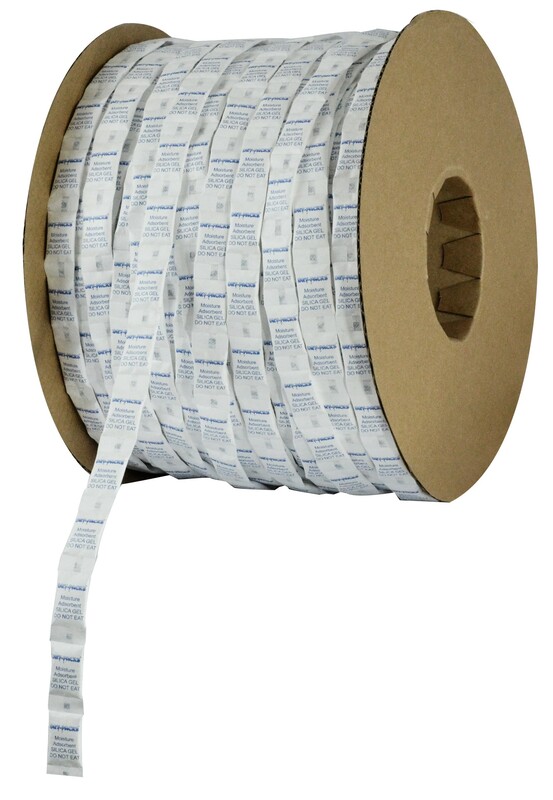 Each roll of Silica Gel measures 11" in diameter and 8" in width and contains 3,000 uncut continuous strips of Silica Gel Packets. They come packaged in air tight & sealed moisture barrier bag and packaged 2 rolls per carton. Our Dry-Packs brand Continuous Strip Pillow Packets do meet FDA specifications and work on most pouch dispensers and insertion machines for easy integration into your assembly line. Dry-Packs Continuous Strip Pillow Packets are currently in operation and have been tested on machines manufactured by ABOX, AZCO, and Multi-Sorb.